trypt-amine \ 'trip-ta-,men \ n. [tryptophan fr. tryptic, fr. trypsin, fr. Gk. tryein, to wear down (from its occurence in pancreatic juice as a proteolytic enzyme) + amine fr. NL ammonia] 1: A naturally occurring compound found in both the animal and plant kingdoms. It is an endogenous component of the human brain. 2: Any of a series of compounds containing the tryptamine skeleton, and modified by chemical constituents at appropriate positions in the molecule. The Copyright for Part 1 of TiHKAL has been reserved in all forms and it may not be distributed. 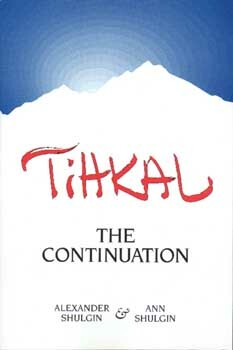 Part 2 of TiHKAL may be distributed for non-commerical reproduction provided that the introductory material, copyright notice, cautionary notice and ordering information remain attached. I would like to take a moment to reiterate that at the present time restrictive laws are in force in the United States and it is very difficult for researchers to abide by the regulations which govern efforts to obtain legal approval to do work with these compounds in human beings..... No one who is lacking legal authorization should attempt the synthesis of any of the compounds described in these files, with the intent to give them to man. To do so is to risk legal action which might lead to the tragic ruination of a life. It should also be noted that any person anywhere who experiments on himself, or on another human being, with any of the drugs described herein, without being familiar with that drug's action and aware of the physical and/or mental disturbance or harm it might cause, is acting irresponsibly and immorally, whether or not he is doing so within the bounds of the law. This HTML version of TiHKAL was created by Bo Lawler with the help of Erowid. The content was generously provided in electronic format by the Authors. The 2D figures were created using IsisDraw and Adobe Photoshop. Additional molecule images suitable for use with the Chime browser plug-in were created by Liquis and are used with his permission. If you have any comments on this HTML version of the text, please contact Bo. The first half of TiHKAL is an excellent commentary on the Shulgin's personal experiences with tryptamines. It also contains a complete cross-index into the chemicals of the second half. Purchasing a copy is highly recommended. The book may be ordered through Transform Press, for $28.50 ($24.50 + $4 p&h). Box 13675, Berkeley, CA 94701. (510)934-4930 (voice), (510)934-5999 (fax). California residents please add $2.02 State sales tax.